Too bad so sad, the weekend is over. We had a whirlwind of a weekend preparing for LO's bday party in the park, and the event itself was a wonderful gathering of friends and family. LO was a little overwhelmed with all the people showering attention on her, but she lightened up once she took a bite of her turtle cupcake cake. I rarely give her refined sugar, and I think she was in heaven while liberally taking huge bites of her cupcake. She nearly finished the whole thing herself, much to the grandparent's dismay. Hopefully her next cupcake won't be until her next birthday! Tonight I have another polish from Fing'rs Heart 2 Art collection that was released recently and found at Walmart, called Black Tie Event. I've been lemming a black jelly polish with gold glitter and I was drawn to this when I saw it on the shelf. 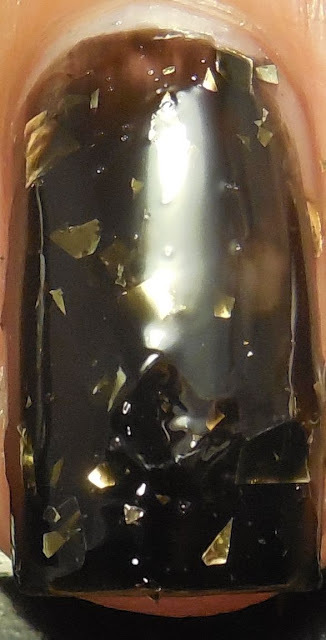 This has a pigmented black jelly formula and is packed with shards of gold. Unfortunately, the product didn't translate onto the nail as well as I'd hope - the shards were too big and stuck out in places and were hard to control. Some of the shards ended up dragging along the nail with the 2nd coat. Here, I used two coats and finished with a layer of Essence Gel Look Nails but the shards are still sticking up. I hate when a great concept doesn't pan out in actuality. If the shards weren't so big, this may have worked. As it is, they're too large so the dragging and clumping becomes an eye sore. I don't think I could wear this for a full day - I'd start picking at the little pieces that are sticking up from the mani. Fing'rs needs to go back to the drawing board for this one, and I need to keep looking for a functional black jelly with gold glitter. Any ideas? LO's birthday is on Tuesday... Don't forget to enter my giveaway that ends that night!